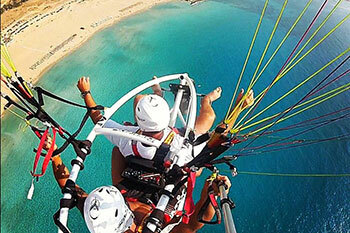 Diving, Paragliding & Windsurf, in Falassarna. The underwater world of Falassarna. When describing the sea of Falassarna one doesn’t know where to begin or end. All you need to do is to grab your mask and snorkel and jump into the sea from wherever you are, whether that is from the sandy beach or the rocky sea coast. You will see things which you will remember for the rest of your life. The beautiful crystal clear waters are home to unbelievable shapes, colours and an abundant number of fish, of all types and sizes. Also, you will see a wide variety of sea creatures, such as starfish, sea urchins, anemones, crabs, shells, small corals and sponges, just to name a few; they will all parade in front of your eyes continuously. For the beginner, the rocky sea beds are an ideal place to catch small fish, or even bigger, if luck is on your side. This can be achieved with the help of a spear gun and other appropriate equipment. to scuba dive. If the weather conditions allow, you can sail a little further towards the rocky island of Pontikos, or the islands Imeri or Wild Grambousa. 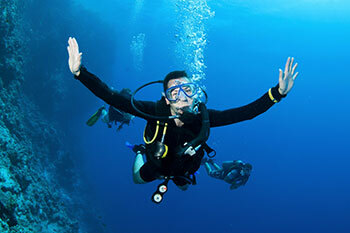 There are many areas which will satisfy even the most curious diver. the islands and luscious green hills while you are flying over the beautiful blue sea. The westerly wind, which is common in the area, helps paragliding off the hillside easily. The advantage of this hillside is that it has a dynamically developing updraft air which can be taken advantage of, so you can fly for many hours. for paramotor and paratrike. Here you can fly with professional pilots, one of whom is George Kissanakis. 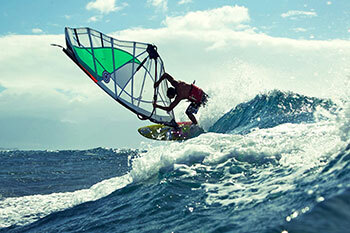 If you want your holidays to include “thrilling” games with the air and sea, or if you want an adrenaline rush then, can you think of something better than kitesurf or windsurf?